Hey friends, I'm going to attempt to launch a new initiative in May. My plan right now is to post a new video every day in May. It rhymes for one, and I haven't really been consistent with the YouTube channel. I'm hoping this will help increase subscriptions and views as well as provide someone out there with some useful information. What I'd like to know from you is what types of wrestling talk videos do you watch. Some channels out there have videos with hundreds, even thousands of hits. That is my ultimate goal. 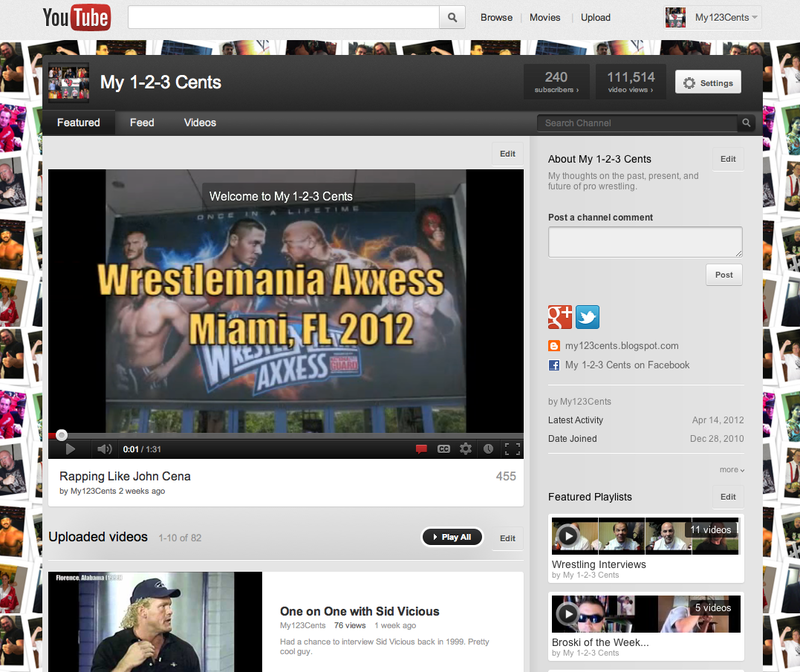 Right now my series of "One on One" wrestling interviews is the most viewed. I've had an opportunity to meet and interview some really great stars from the past and present. So besides those types of videos, what would you like to see on the channel. If you don't want to post comments here, please email me, kevinhunsperger@gmail.com. I'm looking forward to this project and getting "YOUR" 1-2-3 Cents too. RAW, Smackdown, Impact and PPV reviews. Q&A's and maybe some past PPV reviews, example: SummerSlam, Survivor Series, Rumble, WrestleMania reviews. Bring back Old School Warrior to help do reviews! Maybe PPV pre-views and predictions. Hope that helps. Also maybe do: This Day in Wrestling History and give your thoughts on that event that took place.